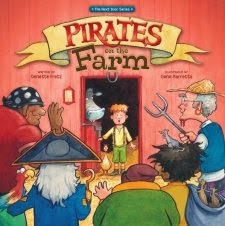 I recently read PIRATES ON THE FARM to my kids to get their opinion of it. Its my newest review book and, since its a children's book, why not ask the children? So, the three of us sat on the couch and snuggled together so we could all look at the colorful pictures together. I asked my 11-year-old son what he thought of it, and he said he loved it. What boy doesn't love a funny book about pirates! I asked him to rate it between 1 and 10, with 10 being the best book ever. He said he would give it an 8. The book shares a message about loving our neighbors (Luke 10:25-37); about befriending those who are different than us; about giving people a chance; about sharing God's love with those who need it most. It conveys this message in a fun way that is appealing to ALL ages. Before reading the book to your kids, I do suggest looking up the vocabulary words in the back of the book. Many of the words are difficult to read and understand. (Examples: doubloons, hardtack, scrimshaw, and seadog). Its interesting to learn the definitions to these pirate-loving words. In that sense, the book can be used as an educational tool. However, smaller children may have a harder time "getting it." Overall, it is a fun book with a good message. A great conversation starter! Disclosure: I received this book free from Thomas Nelson Publishers through their BookSneeze.com book review bloggers program. I was not required to write a positive review. The opinions I have expressed are my own. I am disclosing this in accordance with the Federal Trade Commission.